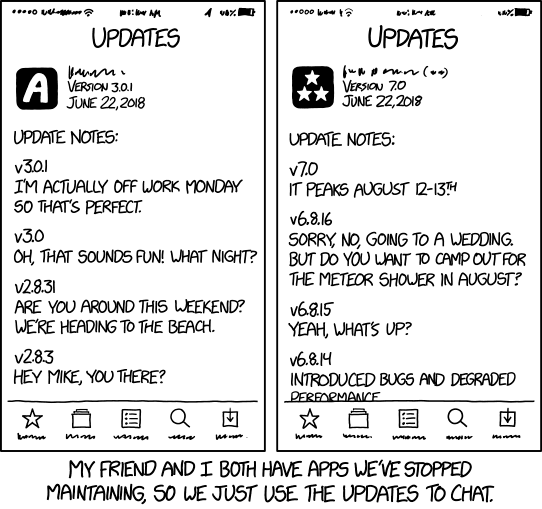 Title text: v3.0.2: Hey, if anyone still using this app is headed to the beach, can you stop at 4th and River St and grab the sunscreen from my car? Trunk should be unlocked. Thanks! Hm, that way of communicating seems terribly inefficient. The title text was funny though. Well, at least v6.8.14 was probably given an accurate description of most 'improvements and additions' reversionings ever. Geez, what about all the people who have both those apps? Gonna make them feel left out of the conversation ... or like they're eavesdropping. Use Morse code. Or telegrams. I have used both these and this explains a lot. qvxb wrote: Use Morse code. Or telegrams. Telegram is banned in many countries. Mister Xkcd you forgot the obligatory meme. Here, I fixed it for you. I was referring to the telegram of Western Union. teelo wrote: Mister Xkcd you forgot the obligatory meme. Here, I fixed it for you. It's subtle.. check the battery levels. HES wrote: It's 94% empty.